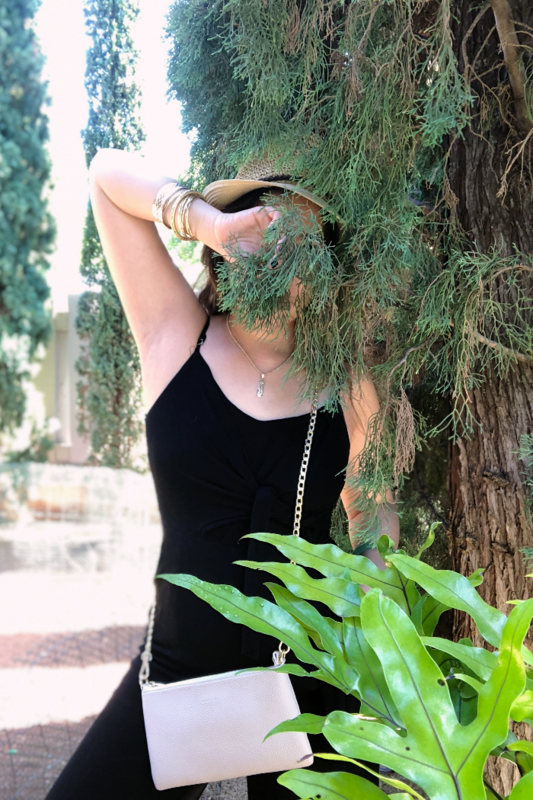 Following a well-received post last week (Vitamin C in Skincare), I am back with another edition of “The Truth”, this time I am shedding light on another popular skincare ingredient, hyaluronic acid. But first, let’s understand few basics so you and I are on the same boat. In the dermis (a.k.a “true skin”, found below the epidermis and above subcutaneous layer, composed of collagen, elastin, blood vessels, sebaceous glands) collagen is what makes the skin look firm but it’s hyaluronic acid that provide nourishment and hydration to collagen. 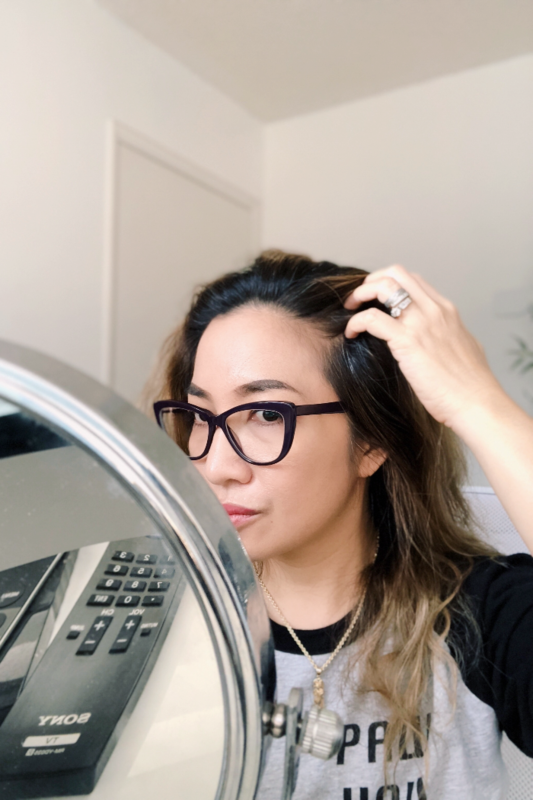 In the field of aesthetics, hyaluronic acid is the the most commonly used dermal filler (I talked about it in details here). But there is sodium hyaluronate, a salt derivative of hyaluronic acid which reportedly has smaller molecules that are able to penetrate dermis. Used in skincare, it has the ability to hold more water which results to tauter skin albeit temporarily. In skincare, hyaluronic acid and sodium hyaluronate are used interchangeably but bear in mind that they are not one and the same just like how you and your sibling have the same last name but with different genetic configuration. So let’s study my skincare stash and see if we spot either hyaluronic acid or sodium hyaluronate. I have underlined those that I like and italicized the ingredient I wish it didn’t have (personal preference or otherwise) or in the gray area. 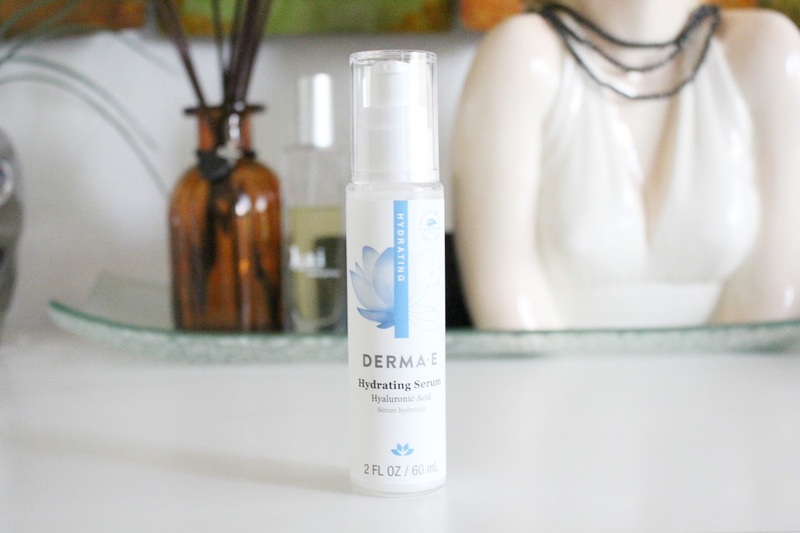 Derma-E Hydrating Serum Hyaluronic Acid ($29.50, 2 fl oz/ 60ml). Company description “The secret to silky-smooth skin. 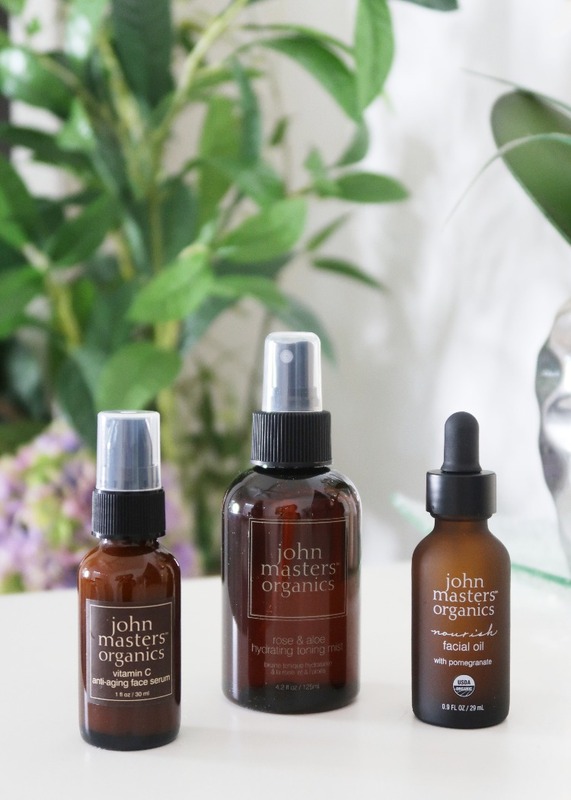 This intensely moisturizing serum is full of skin-loving nutrients that nourish, reduce the appearance of fine lines and wrinkles, and leaves skin feeling soft and smooth”. Ingredients: Purified Water, Glycerin (Vegetable Derived) , Cetearyl Alcohol (Plant Derived), Ceteareth-20, Dimethicone, Sodium Hyaluronate (Hyaluronic Acid; Actimoist® Bio-1), Ascorbyl Palmitate (Vitamin C Ester), Ammonium Acryloyldimethyltaurate/VP Copolymer (Aristoflex®), Panthenol (Provitamin B5), Allantoin, Alanine, Leucine, Tyrosine, Glycine, Valine, Xanthan Gum, Potassium Sorbate, Phenoxyethanol, Ethylhexylglycerin, Fragrance. My personal opinion: Derma-E is one of my favorite cruelty-free and paraben-free skincare brand. I’m glad that they revamped their packaging, blue and white combo is more visually appealing and calming! Overall I like this serum because I feel tautness every time I use it; while it smells good, the floral/chemical scent can be too overwhelming to some. I spot sodium hyaluronate (#6 in 21 ingredients) which is mixed with other skin-hydrating formula. I also like that it has a derivative of Vitamin C (ascorbyl palmitate). I spot hyaluronic acid side by side with their proprietary concoction, Actimoist® Bio-1 which according to the company website is “a safe alternative to animal-derived hyaluronic acid, being that it’s produced from bacterial fermentation”. But basically you get what I meant earlier, it’s really sodium hyaluronate (penetrates dermis) but hyaluronic acid (can’t penetrate dermis) is hyped on the packaging. Actimoist® Bio-1 is not a standard name in INCI but rather proprietary to Derma E. Traditionally, hyaluronic acid is sourced from rooster comb but modern day technology has shifted the production using microbial fermentation because it’s cheaper and cruelty-free (source NCBI). 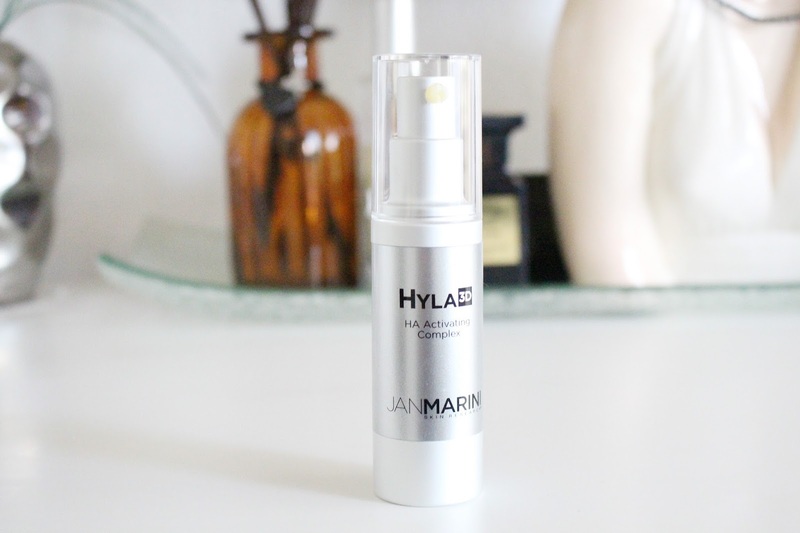 New in my stash but enjoying it, Jan Marini Hyla3D HA Activating Complex ($125, 30 ml/ 1 fl oz). Company description “Revitalize and volumize with Hyla3d HA Activating Complex. Take a 3-dimensional approach to restore skin’s hydration and youthful volume (1) multiple forms of hyaluronic acid for deep and long lasting hydration (2) advanced technologies enhance hyaluronic acid within the skin (3) peptides and oxidants boost collagen and elastin. Ingredients: Water/Aqua/Eau, Glycerin, Butylene Glycol, Sodium Hyaluronate, Acrylates/C10-30 Alkyl Acrylate Crosspolymer, Sodium Hyaluronate Crosspolymer, Saccharomyces Lysate Extract, Oligopeptide-24, Ubiquinone, Calcium Ketogluconate, Peucedanum Graveolens (Dill) Extract, Panthenol, Lecithin, Hydrogenated Lecithin, Tocopherol, Dimethicone/Vinyl Dimethicone Crosspolymer, Xanthan Gum, Caprylic/Capric Triglyceride, Glycine Soja (Soybean) Oil, Sodium Hydroxide, Potassium Phosphate, Pentylene Glycol, Ethylhexylglycerin, Caprylyl Glycol, Sodium Oleate, Citric Acid, Isoceteth-10, Silica, Lactobacillus Ferment, Alcohol, Hexylene Glycol, Disodium EDTA, Phenoxyethanol. My personal opinion: It doesn’t say anything on the bottle that it has hyaluronic acid but if you’re a skincare junkie, you know what HA stands for in skincare. I like that this serum feels light on the skin, dries fast and leaves a velvety soft mantle. I also like that it’s fragrance free. I see sodium hyaluronate right away (#4 and #6 from 35 ingredients) as standalone and cross-linked to make the molecules penetrate dermis. I see alcohol and as previously mentioned, while its use in skincare is largely debatable, I prefer not to have it if I were to create my own skincare line. I use this in the morning in conjunction with Vitamin C.
We carry some eltaMD products at our clinic because they are directly promoted to doctors with clinical studies to boot. While it doesn’t mention anything on the bottle that it has hyaluronic acid, I would like to include Barrier Renewal Complex ($45, 1.7 oz/ 48 g) because my prying eyes spotted hyaluronic acid in the ingredient list. 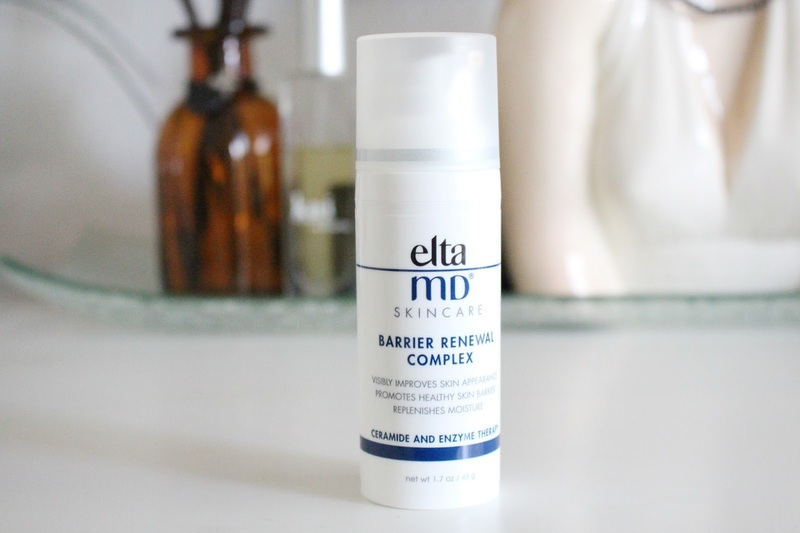 Company description “EltaMD Barrier Renewal Complex restores the vibrant glow of youth by improving the tone and texture of your skin. Five unique ceramides replenish moisture loss and increase water retention to soften lines and wrinkles and instantly comfort dry skin. Enzymes and essential lipids strengthen your complexion and promote cell turnover to make your skin bright and smooth”. My personal opinion: This stuff is very hydrating which makes it ideal during winter/cold weather. It’s quite sticky when rubbed but once it sits on top of the skin, my face looks and feels soft. Whenever I use this at night as last step to skincare (I rotate products), I wake up with extra glowing skin but I use several products so it’s more like a synergistic effect. I see HA but I doubt if it has any significant bearing because we don’t know how much of it is present plus it’s mixed with other moisture-rich formula. I like that it has Niacinamide (a.k.a Vitamin B3, I will cover this on another post) but offhand, it claims to help skin look supple and soft. Again, there’s alcohol, although listed least but I’m not a fan nonetheless. Murad Hydro-Dynamic Ultimate Moisture ($75, 1.7 fl oz/ 50 ml). Company description “A clinically proven anti-aging moisturizer to relieve dry, dehydrated skin and restore youthful resilience and tone. Hydro-Dynamic® Ultimate Moisture is clinically proven to lock optimal moisture levels in the skin while delivering instant comfort. This super-hydrating antiaging formula is moisture rich, yet light and non-greasy. Collagen support complex helps restore youthful resilience and plumpness to dry skin while avocado, sunflower, and olive fruit oils enhance skin’s ability to retain maximum levels of hydration. Retinyl palmitate and shea butter improve texture and tone while restoring natural smoothness and softness. This gentle formula is safe for sensitive skin and is ideal for use with any Murad regimen as a step three moisturizer. It comforts and restores youthful hydration to dry skin as part of Dr. Murad’s Inclusive Health® System of care”. Ingredients: Water, C12-15 Alkyl Benzoate, Caprylic/Capric Triglyceride, Glycerin, Sunflower Seed Oil, Butylene Glycol, Glyceryl Stearate, Glyceryl Behenate/Eiosadioate, Dicaprylyl Carbonate, Shea Butter, Cetearyl Alcohol, Myristyl Myristate, Cetyl Alcohol, Ethoxydiglycol, Phenyl Trimethicone, Stearic Acid, Oat Kernel Extract, Saccharomyces Cerevisiae Extract, Laminaria Digitata Extract, Yeast Amino Acids, Betaine, Inositol, Taurine, Trehalose, Soybean Sterols, Corn Starch, Olive Fruit Oil, Avocado Oil, Sodium Hyaluronate, Dipotassium Glycyrrhizate, Tetrahexyldecyl Ascorbate, Tocopheryl Acetate, Linoleic Acid, Phospholipids, Polysorbate 60, Acrylamide/Sodium Acryloyldimethyltaurate Copolymer, Isohexadecane, Glyceryl Polymethacrylate, Panthenol, Jojoba Alcohol, Potassium Jojobate, Polysorbate 80, Urea, Glucosamine HCI, PEG-8, Bisabolol, Sorbitan Oleate, Cetearyl Methicone, Dimethicone, Palmitoyl Oligopeptide, Retinyl Palmitate, Allantoin, Xanthan Gum, Disodium EDTA, BHT, Ethylhexylglycerin, Chlorphenesin, Phenoxyethanol. 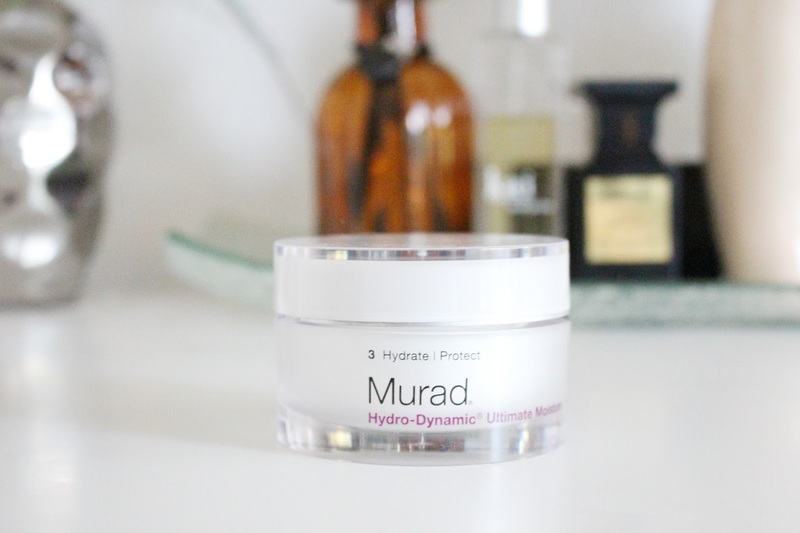 My personal opinion: Long before I started this blog, Murad is a staple most especially their anti-acne line so I am always excited to try anything from this brand. More than a moisturizer, I find this product a nice makeup primer so if you need extra hydration pre-makeup, this is like 2-in-1 gem. Again, the packaging does not harp on hyaluronic acid but I spotted sodium hyaluronate (#29 from a long 60-ingredient list) tucked away in combination with all other moisture-rich formula. I have italicized retinyl palmitate despite it being a derivative of Vitamin A (excellent for skin texture) because it’s listed least but it’s hyped on the website as if it’s the most active ingredient. And so I repeat, because in real world, perfection does not exist. My point is not to negate the various claims presented by the aforementioned brands or the rationale behind their chosen ingredient mix. Skincare after all is relative. What works for you may not for me and vice versa. But it does help to read the label because if you won’t, then who else will? Informed decision certainly beats impulse purchase. What a useful and instructive post, twinsy! Hyaluronic Acid is such an amazingly effective skincare ingredient! I love using HA serums! I agree, it's a good moisturizer but it does not enhance collagen and elastic production due to its large molecular size. Another GREAT informative skin care review. So important to know the ingredients, where they fall in the line of actives and to know the difference between the different types of skin care products with the same name…all Hyaluronic Acids are not made equal. Love these posts, Kathryne! This is amazing. I am grateful there are bloggers like you passionate about skin care that can help women like me, who are not. I enjoy reading about it, and having it explained. I really wouldn't have understood otherwise!!! And now that I understand, I want to try it – I have stayed away from it out of concern but I don't think those concerns are founded. Thanks much Judy. I am doing more of these organic content type. Another extremely helpful article. I've always looked for hyaluronic acid in products but didn't realize the difference between the two types. I really wish the Dermae didn't have that fragrance. That Derma E is so nice! I like Reviva Labs hyaluronic acid serum. Thanks for these educational posts! They really help me in deciphering the products that I currently have on my vanity. My skin has been really dehydrated lately, so I've been using more products with HA in my routine. They're definitely helping! I really have been loving these posts… so much information. I incorporate HA products into my routine because my skin is so dry – without it, I find I lose the moisture before the days end. The top two in this post are the ones I'm currently using. Thanks for sharing this wealth of info. These types of posts are so helpful! Often you see people saying "You NEED skin care with x benefits in them" but rarely an explanation as to why. I think I missed the Vitamin C one, so I'm going back to read that now! This was a great read! I am always happy to find HA in my products. I love how well you explained this and featured different products. 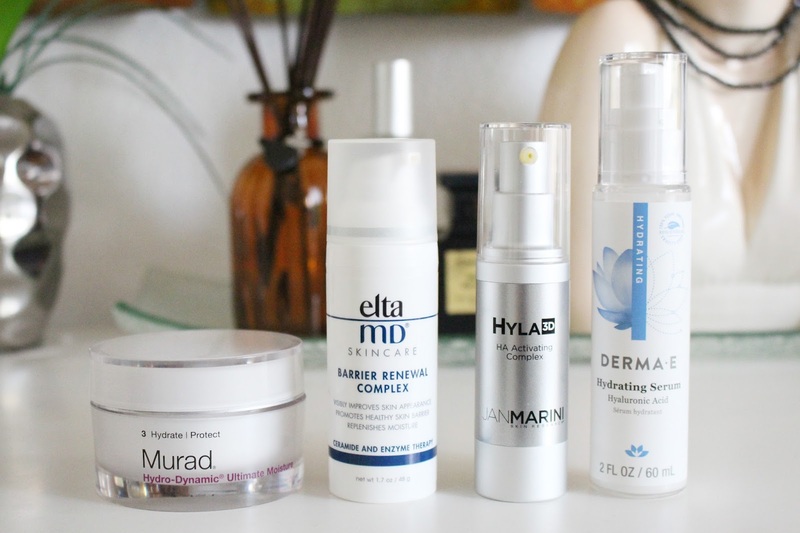 I've used both the Murad and Derma-e! It definitely tends to be combined with things that help me refresh my dry skin! Again, such a great post! I love Hyraluronic Acid because it's gentile on my skin.